Does Kim Kardashian Know About This? •Stuart Appleby became only the fifth golfer to shoot a 59. That's an absurdly low number, but kind of hard to grasp. To put it into perspective, it's kind of like if you devoted your entire life to golf, made a successful career out of it, then one day, managed to shoot a 59. •Ozzie Guillen says Latino players are treated worse than their Asian counterparts. But how does this affect Bruce Chen, of Chinese descent but born in Panama? •Both Knowshon Moreno and Correll Buckhalter got hurt on the first day of Broncos training camp. The result of divine intervention, we assume, on behalf of opening day starting running back Tim Tebow. •Darrelle Revis, the eighth highest paid DB on the Jets, began his holdout yesterday. He wants enough guaranteed money to buy an actual Revis Island. •But it's not officially preseason until Kim Kardashian shows up to bang one of the players. 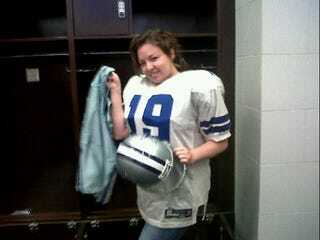 She took in Miles Austin's practice from a suite at the Alamodome. That other chick up there? We've got no idea.